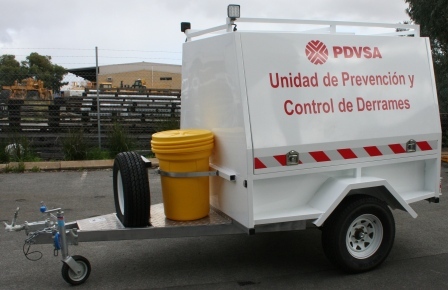 Application: 2100 litre Spill Response Trailer with oil, fuel & hazchem absorbents, clean up tools, PPE & accessories. Heavy duty 7'x5' industrial single axle trailer with extended drawbar and off road jockey wheel. Hot dip galvanised chassis with marine grade aluminium enclosure for maximum corrosion resistance in arduous mining or marine environments. Heavy duty off road tyres & Sunraysia style rims - landcruiser stud pattern with matching spare wheel and tyre. Sealed side and rear doors with internal bracing, recessed locks & gas struts. Open doors can be used for shade or weather protection. 150mm high roof rack and roof mounted LED work lights with individual isolators. Sheltered work centre at rear of trailer with fold out table, instruction manual and MSDS. Integral storage shelves with labeled storage boxes - boxes are fitted with security tags. A range of clean up tools including long handled metal shovels, natural fibre brooms, long handled rake and anti-static, non metallic shovels. Oil & fuel only absorbent pads, rolls, pillows & mini booms. Hazchem absorbent pads, rolls, pillows & mini booms. Oil/fuel absorbent emergency deployment marine booms & mops. Ground absorbents including mineral sponge, oil/fuel only peat and an all liquid cellulose based floorsweep. Ancillary items including safety cones, drum repair putty, pipe repair bandage, quick break degreaser, safety torches & barrier tape. Clean up items including contaminated waste disposal bags, large Hazguard waste drum, knife, rope & storage crates. PPE - 6 x sets of chemical resistant work gloves and bulk clean up gauntlets. PPE- 6 x sets anti-static disposable coveralls (plus 6 x spare), wet weather trousers/coat and steel toe gumboots. PPE - 6 x sets safety goggles, hard hats, face shields and half face respirators with twin filter cartridges. PPE - 2 x 1 litre emergency eyewash, first aid kit, cleaning wipes & hand cleaner. Spill Response Trailers can be customized by adding, swapping or changing any of the components or items listed to provide a tailor made work solution for any application.